Every day is a fight for survival. No one knows that better than you. As long as you can remember, you have been fighting. For food, for money, for respect. Your knuckles and your soul are hardened, crushing a jaw no longer hurts. You have learned the warrior’s secret: It’s not about who is the strongest. It’s about who will never quit. You have learned how to fight, with your bare hands or with a sword or other weapon. You could be a noble knight (matgor „servant“) or a mean mercenary (corru lit. „blade“), an outlaw or a street gang member, a soldier, a city guard, a bounty hunter or some other kind of warrior. The only thing you really know is how to fight and how to survive a fight. Your history is covered in blood and strife, your future is dark and grim, providing nothing better than a quick death by your enemies blade one day. Yet, there are others that need your strength and can’t fight their battles themselves. After all, you have a tiny place and a faint shadow of meaning in this violent and unforgiving world. Face: broken nose, dead eyes, scarred head, welding mask, hockey mask, metal jaw. …was still standing after one of your punches. …is wonderful. Some day he/she will be yours. To crush everything that is pretty. That your beloved will love you back. To build rather than destroy. The Chief Ancin, who killed your previous chief and tortured you. 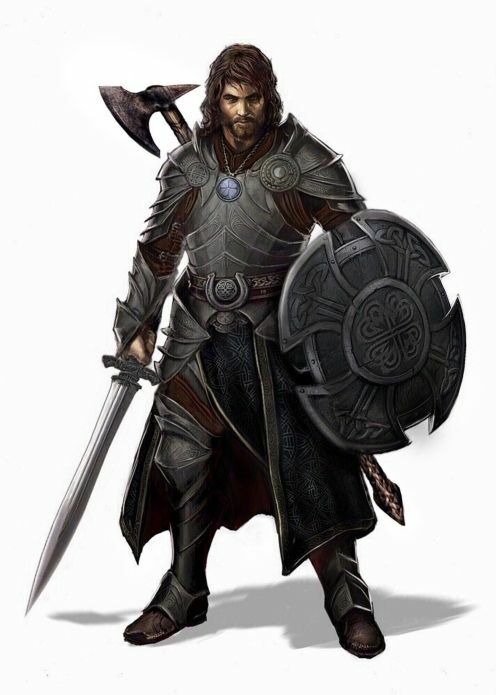 The Warrior Narder, the only one who beat you in a fair fight. The Trader Bertio, who you think stole your stash of gear. The Chief Coenge who takes care of you. The Chronicler Breda, whom you secretly desire. Nobody. No one in this rotten world deserves to live.